Comfort Gel Slippers have cushy comfort gel support that contours to your feet! 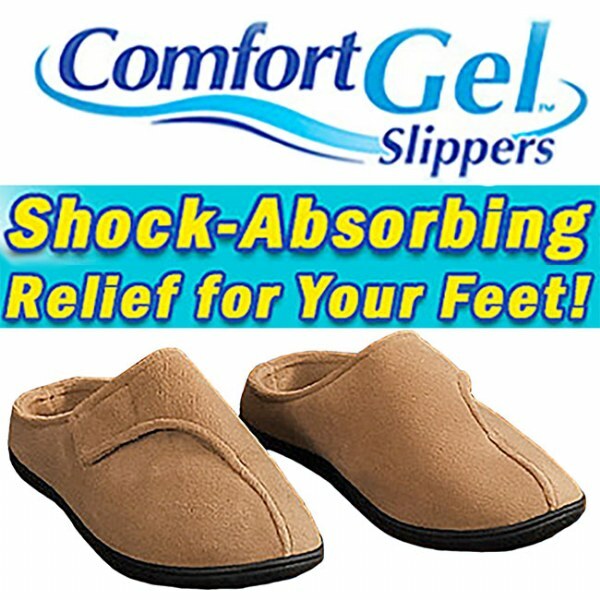 Comfort Gel Slippers are the revolutionary anti-fatigue gel slippers. It soothes, relieves and energizes your achy feet and body which happens when you stand for long periods of time. Pressure from prolonged standing can cause pain in your feet, knees and lower back. Comfort Gel Slippers have comfort gel soles which are incredible in acting like a shock absorber. It takes all the pressure off your feet and joints and helps relieve aches and pains. Comfort Gel Slippers keep you supported as it cushions your feet in total comfort. It&apos;s great for indoor and outdoors and comes in two colors; black or tan. Comfort Gel Slippers have cushy comfort gel support that contours to your feet. Compared to ordinary slippers, Comfort Gel Slippers will never flatten out. It is made of ultra soft micro-terry that&apos;s so gentle on your feet. Your feet will feel cool in the summer and warm and snug during winter. Comfort Gel Slippers have durable, non-slip rubber soles so it&apos;s great whether indoors and outdoors. It has adjustable hook and loop closures that ensures a perfect fit whether your feet is wide or narrow. Comfort Gel Slippers are machine washable. It will always look and smell like new slippers. These are so nice & comfortable!